Wrought in 18-Karat gold. Embedded with 20 white diamonds and crowned with one rare blue diamond on a spinning globe. With Passport to 50’s journey poised to begin and end in Asia, DreamMaker’s founder Gregory flew to Singapore to meet with Karan Tilani, Director of World of Diamonds Group, to discuss their willingness to create something special for a billionaire traveling the globe with family and friends. What could The DreamMaker offer a billionaire who has everything and then some? The purpose was to create a piece that would tell a story – and keep telling that story vs. being tucked away in a safe. The DreamMaker wanted an item that could be deemed very personal without having to be worn. Rather, an objet d’art to share with anyone who might be entertained in their home. “We were discussing possibilities over a cocktail and as I was stirring my drink, it hit me – a swizzle stick,” said Gregory Patrick. “I envisioned something that represented the trip’s 20 city landings, symbolized by white diamonds, and crowned by a rare blue diamond, World of Diamonds Group’s signature sparkler,” said Gregory Patrick. “What better way to highlight the blue skies traveled throughout the journey?” The piece was commissioned on the spot. 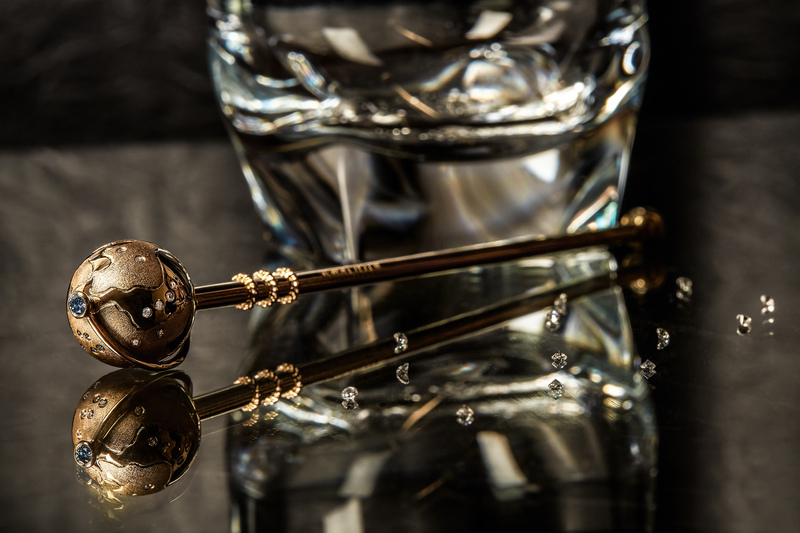 At World of Diamonds Group, where master craftsmen are known for creating exceptional pieces with diamonds and precious metals for the most discerning of clients, the world’s ultimate swizzle stick was brought to life. “The swizzle stick is a Picasso of diamonds & beyond – a masterpiece that stirs conversation.” said Karan Tilani. Passport to 50 will feature a set of 50 swizzle sticks worth $ 1 million. Commissioned by DreamMaker, the world’s most expensive swizzle stick has been crafted by Russian-based World of Diamonds Group and is valued at $20,640. The diamond mining powerhouse engaged 3 designers and master craftsmen, who worked a total of nearly 630 hours and over a month to construct the swizzle stick by hand. Among the main considerations of the design process was practicality, the globe’s density – relating to stability, and positioning the diamonds prominently so that they exhibit maximum brilliance. The swizzle stick weighs almost 26 grams, and flaunts about 5 times more 18-karat gold than an average wedding ring. Recognizing its artisanal provenance, the creation is finished in a unique combination of matt and gloss plating, hallmarked “750” and “W.O.D Genève”. 21 round sparklers of exceptional quality are mounted on a swiveling globe atop the swizzle stick. 20 colorless diamonds represent every city landing of Passport to 50 and a rare 0.11 carat fancy blue diamond, encrusted on the crescent that grips the globe, evokes the blue skies traversed on this trip. The swizzle stick is presented in a hand-stitched leather case, complete with gold-plated engravings, a dedicated catalog and lifetime guarantee.